At Candy Tours, we pride ourself on the quality of our drivers, minibuses and the variety of the trips and excursions that we offer. Whilst the high quality of our drivers is a given, all passing the rigorous commercial operator license required, it is the flexible and friendly approach that makes us stand out. We only recruit drivers who meet our high standards of customer service and can deliver an amazing experience to all customers, all of the time. Our all 5-star Google & Facebook reviews, along with personal feedback verbally, via email or even by hand written cards are a fine reflection on how the entire team reflects our incredible service ethos. To be a driver at Candy Tours UK, you must be excellent behind the wheel but just as importantly always have a smile and go the extra mile for our incredible customers. Our ethos is for our guests to feel looked after, safe and to have fun! To ensure our customers' comfort we use the latest Mercedes and Ford minibuses. They are stylish and take 16 passengers (plus luggage within our Mercedes) and are typically air-conditioned, very comfortable with reclining seats, high ceilings and are maintained to an extremely high standard. There is a step to help people in and out and, of course, our friendly driver is always there to lend a hand if required. We take safety very seriously and our vehicles have independent safety inspections at least every 10 weeks. All our drivers are checked using the nationally recognised Disclosure and Baring Service and are fully qualified passenger vehicle drivers with ongoing competency training. The company was founded by Andy Martin in 2016. Having grown up in the Surrey / Hampshire borders Andy has intimate knowledge of the areas' historic sights, beautiful coast and stunning countryside. Having travelled to many other countries and with the benefit of the passing years, Andy realised what a diverse and interesting part of the world this is. Within an hour or so drive of Alton, Farnham, Guildford, Basingstoke and neighbouring areas we have magnificent cathedral cities, fantastic shopping, wonderful countryside and coastal areas (two national parks), world-class museums and galleries, diverse towns and charming villages, historical sites and buildings galore, a fantastic maritime heritage, numerous world-renowned authors, all on our doorstep. The passion to share these incredible experiences with others inspired Andy to create Candy Tours UK, allowing him to take people to these places. Seeing the smiles, pleasure and enjoyment of his customers when viewing or having their photo taken with these beautiful backdrops is what inspires Andy to this day. 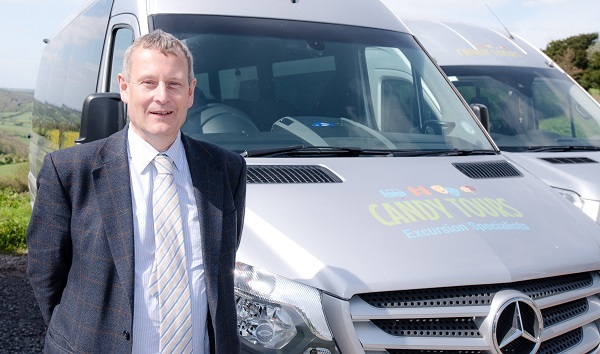 With a growing fleet of vehicles and supported by a fantastic team, Candy Tours UK has now expanded upon its success to offer sightseeing tours, excursions throughout the UK and even holidays abroad. The ethos of the company has not changed however and Andy is as passionate today as he was when he founded Candy Tours about delivering an unbeatable and memorable experience for everyone of his customers.